He is called Father Frost or General Frost. He lives in Russia, and he could be very cruel, especially to those who do not show proper respect to him. He has defeated many invaders, from the khans, to Napoleon, to Nazi Germany. He likes to decorate fields and forests, covering them in pristine snow and sparkling ice. And he is not gentle to those who have no means to keep warm and eat well. 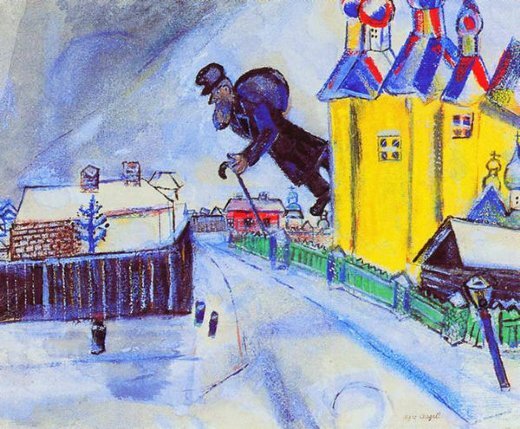 Marc Chagal’s painting Over Vitebsk depicts just such a person, a wondering Jew, poorly equipped to travel on foot through towns and villages covered in snow. He is disproportionally huge, symbolizing the entire Jewish population of 19th century Russia, persecuted and destitute, with no place to call their own. Yet, in the middle of merciless Russian winter, the warmth of Chanukkah lights gave them a glimmer of hope. A very cheerful drawing, beautiful details and a nice colorful. Congratulations!